A quite young and sub adult tiger of out of tourism area. He has made his territory from Amreshwar, Range and Jumar-Babadi area of the park. An Ideal mother of Ranthambhore Tiger Reserve – T-39 or Noor had given her first litter of one male cub as Sultan or T-72 in 2012. The tigress, T-39 with her new born cub was spotted on Monday 21 May 2012 by nature guide Pankaj Jain at Sultanpur Choki in zone no.2. .
She gave her second litter of two male cubs in 2014. This litter was spotted first time on 28 Wednesday May 2014 by well known wild life Photographer, Aditya Singh. The sub adult male, T-88 is one of them. 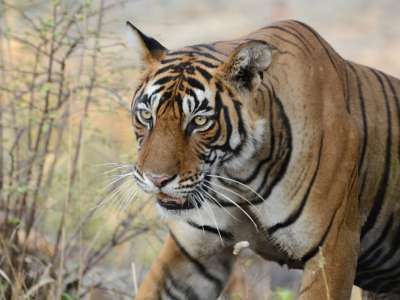 His name is Kallu or kalua and has settled at Amreshwar and Jumar-Babadi area of the park that is also part of her mother’s territory, while his brother became T-89. Little is known about his life.